Connevans are able to provide inductive loop systems for public places to enable compliance with the DDA and the requirements of part M2 of the Building Regulations 1991, Sections 3.12 3.17 which apply to booking and ticket offices, large reception areas, auditoria and meeting rooms. Specifying & installing loop systems for larger rooms is not easy, please download and complete the questionnare in the guide to choosing and specifying public area loop systems on the previous page. For areas larger than 5 x 5m we supply Ampetronic Constant Current Loop Amplifiers which utilise a single turn loop. They can be supplied in kit form ready for DIY installation alternatively we are able to provide an installation service. A good site survey and installation can make the difference between just being able to say that you have a loop fitted or having a loop installation about which people say I enjoyed the session, for once I could hear what was said. The Kit 1 systems are for connecting to an existing PA system – the microphones and any other sound input (such as TV or music source) are as already used in the existing PA system. The Kit 2 systems are for a stand alone system with two radio microphones– this system is supplied with two radio microphones. 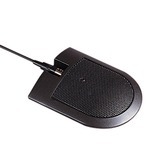 The lapel mic radio microphone is intended for the main presenter to wear and the handheld radio mic can be used by anybody introducing them and also for questions from the floor - which are otherwise very difficult for hearing aid users to hear. A conventional wired microphone is also included in Kit 2 systems. It is our experience that ‘expensive’ radio microphones are sometimes unavailable, locked ‘safely away’ when an unplanned use of the room loop is required; so we include a ‘less expensive’ wired microphone to leave at all times with the loop amplifier. It is also a very good backup for when a user has a problem with a radio microphone – even if it is only caused by a flat battery! All kits are now supplied with a Connevans AFILS Loop Field Strength Meter - a calibrated precision measurement device, designed to meet the requirements of BS7594. ILD300 kit 2 is a stand alone system with two radio microphones. ILD500 kit 1 is for connecting to an existing PA system. ILD500 kit 2 is a stand alone system with two radio microphones. 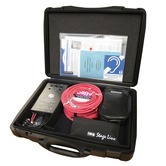 ILD1000G kit 1 is for connecting to an existing PA system. ILD1000G kit 2 is a stand alone system with two radio microphones.